Gin Game’s last-minute change of cast a great success! Against an appropriate backdrop of a Renoir study of a tea dance during the Belle Epoque, the first in a series of seven concerts celebrating the work of Fauré and his contemporaries was held on Saturday, June 20. Before a near capacity audience in the Saisuree Chutiki Music Hall, pianist Ajahn Bennett Lerner and violinist Tasana Nagavajara played music not just by the French composer but also by Tchaikovsky, Brahms and Fauré’s fellow countryman Chabrier. Bennett Lerner, pianist, with Tasana Nagavajara, violinist, performing Tchaikovsky’s charming Andante Cantabile at the first concert in the series. The series of concerts follows the pattern of Lerner’s immensely successful performances and recordings of all of Debussy’s piano works, with visiting musician friends joining him to play music by the chosen composer and his contemporaries. He will play all of Fauré’s Nocturnes and Barcarolles - in chronological order - from 1875 onwards, (Fauré died in 1924), with selected works from the same period. On Saturday, Bennett played - with concentrated brilliance - the first three of the thirteen Nocturnes, revealing the composer’s early mastery of line, and one especially graceful Barcarolle, composed in 1880, the first in A Minor. In vivid contrast, he treated the audience to a dazzling performance of Chabrier’s Suite de Valses, which is an augmented version of waltzes composed for the afternoon dances which were a feature of Paris life for many years. 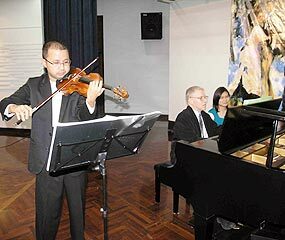 Bennett was joined by Tasana Nagavajara, concert master with the Bangkok Symphony Orchestra and a member of the Bangkok String Quartet, for two works. The charming Andante Cantabile by Tchaikovsky, arranged by Kreisler from a string quartet by the Russian composer to suit his own virtuoso technique. The warm, honeyed tones of the violinist were warmly applauded. Tasana and Bennett ended the recital with a substantial work by Brahms, his three movement Sonata No 1 in G Major. The duo obviously have great rapport, achieving a seemingly effortless balance within the performance - no doubt belying hours of work and preparation. The warm response of the audience augurs well for the remaining six events which will be spaced out during the coming months, with the second concert scheduled for Saturday, September 20, also at 7:30. Bennett will be joined on this occasion by the tenor Jan-Ate Stobbe in works by Mahler, Johann Strauss and Verdi complimenting those by the French master. The lucky recipients receiving their awards. Last week, for the 13th year running, Todd Cilano, GM of the Four Seasons Resort, presented two scholarships to students at the Maewittayakorm High School, located close to the resort in Mae Rim. After interviewing a dozen nominated students, senior Thai executives from the Four Seasons chose Mayurachat Simsee and Suthep Saeja to receive the 7,000 baht scholarships, based on their academic qualifications and their needs. Addressing the whole school, the principal, Yongyuth Sunpaudon, thanked Todd Cilano, who in turn pledged that the hotel would continue to support the school and its students. Having a special event? Why not contact around [email protected]? Past, sweeping away of time, memories that never come back, regrets that leave their scars and dreams that were never fulfilled. None of these strike back as vividly as they do to two people in their twilight years playing Gin in an old folks’ home. That’s the powerful and enchanting theme of D. L. Cubern’s Pulitzer Prize winning two act/two character play “The Gin Game”, brought to Chiang Mai this summer by the Gate Theater Group. 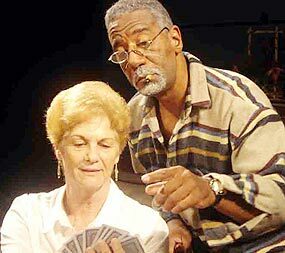 Joyce Matchett, (Fonsai) and StephanTurner, (Weller), on the first night of the Gate Theater’s performance of “The Gin Game”. The play unfolds with lively yet revealing encounters between Weller Martin and Fonsia Dorsey. Weller is seemingly an unnoticeable old man killing his time by playing cards - till he meets Fonsia. Things change suddenly for both of them, as she challenges his Gin skills by beating him in every game they play. This infuriates Weller and the game becomes a focus of their sparking encounters and shifting relationship. Weller and Fonsia’s chats, fights, gossips and intense rivalry reveals to the audience exactly who they are. Characters so familiar and identifiable, yet easy to ignore in the daily course of life. Old people living quietly with their suppressed anger; struggling to live “the rest of their lives”. “Loneliness - it’s as simple as that,” as Weller Martin puts the dilemma, in honest words. “The Gin Game” is the second drama venture in the city by Stephan Turner, founder of the Gate Theater Group, who was noted for his wonderful performance in “The Dodo Bird” by Emanuel Fried, acted in and directed by Stephan himself. He is a graduate from the Goodman School of Drama and the Theater School of DePaul University and also founded Stage Actors Ensemble of Chicago. He now brings his wide experience from Chicago to the Chiang Mai theatre scene. Due to the original “Weller”, Ron Kadsan’s unfortunate accident, Stephan took up the role himself at the last minute and gave a brilliant performance on the show’s first night on June 13, earning huge applause from the audience. The convincing and powerful acting of Joyce Matchett as the witty, seemingly proud yet vulnerable Fonsia was surely a treat to watch for the audience. Her interpretation of the character of Fonsia made it hard to tell that this was Joyce’s debut in theatre drama. Also a painter and writer, Joyce has spent most of her years travelling and living around the world. She comes from Minneapolis, Minnesota and is now living in Chiang Mai, having planned to stay in Thailand for five years. Despite being a small group, the Gate Theater managed to touch an emotional yet witty story through a brilliantly written script. Chiang Mai, (which is not well known for English theatre! ), enjoyed the presence of both a local and an international audience for “The Gin Game”, a production mounted purely for the sake of art. The city’s thirst for more English language plays will be catered for soon by the Gate Theater’s upcoming projects Further performances of “The Gin Game” will follow every Friday and Saturday till July 12. This exceptional and finely-acted play provides food for thought along with entertainment, and should not be missed! The guys from Freedom House, (and Elena), enjoying a relaxing and informative Saturday afternoon at Huaw Tung Taew reservoir. Last week, volunteers and workers from the KissMetta project met up for a brainstorming session over lunch in the beautiful setting of Huey Tung Tao reservoir. Their aim is to make Freedom House School self-supporting by opening a coffee shop and entertainment venue at the front of the school premises. After their recent highly successful fun evening and art auction at JJ Markets, which raised over 90,000 baht, they will now plan for the autumn’s fund-raising events, so, please, “watch this space” or, rather, this paper, for further information! Freedom House is a non-profit school for underprivileged children and adults who live in Chiang Mai. It offers free classes to its students, who do not otherwise have access to education. Since 2006, the school, which holds its classes in the evenings, has been providing its students totally free education including Thai and English language classes, art and music, in order to better equip them for the future. Honoring the Graduates; Mike Hock, (senior counsellor), Sutthichok Linprasert, Keely Robinson, Auchisa Tapanakornvuk, Shannon and Michael Morrow, Kridipak Mongkolyuth, Tana Luksanapiruck and Supapong Nilket (l/r). A reception organized and hosted by the Academy for Education USA, (ACE), took place Friday, June 20, at the Holiday Inn, attended by U.S. Consul General Michael Morrow and his wife Shannon and over 60 guests. The aim of the reception was to inform and congratulate Chiang Mai scholars and ACE interns who are planning their entry to American universities in the fall semester. 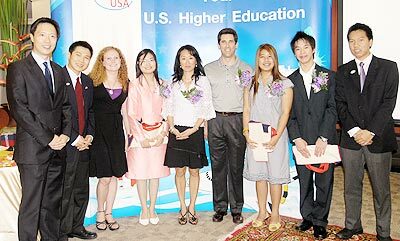 Senior counselor at ACE, Mike Hock, reported the successes of the organisation’s students in many US universities, including American, (Washington D.C.), Boston, Michigan, Princeton, St. Olaf, UC Irvine, Vanderbilt, Wellesley, Wesleyan, (Connecticut), and William & Mary. He stressed that, in the past year, ACE counselors had dedicated significant resources to advising students in both Bangkok and Chiang Mai, and had given over 1 million baht’s worth of scholarships for the Academic Test Prep, (SAT, TOEFL, etc). Ace students themselves had been awarded over US$1 million’s worth of scholarships for undergraduate degree programs. He believes that there is momentum for more Thai students to achieve their goals. 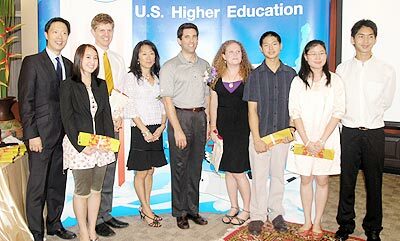 CG Morrow warmly congratulated all students entering American universities in the fall, and presented souvenirs to 3 scholars; Kritipak Mongkolyuth, (Prince Royal’s College to Boston University), Tana Lucksanapiruck, (CMIS to St. Olaf College) and Aunchisa Tapanakornvut, (PRC to Wesleyan University). Whilst giving her best wishes to the scholars and interns, Shannon Morrow emphasized the sacrifices made by parents and teachers, saying that, being a mother and a teacher herself, she knows only too well how hard it is to bring up children. Aimmee Tapanakornvuk and Tong Teriyapirom (l/r). The last two performances by the Gate Theatre Group of “The Gin Game”, on Friday and Saturday July 11 and 12, have been designated as special benefit nights. Revenue from the ticket price of 300 baht, which is considered as a donation, will be given to Zonta’s “grandmas and orphans” fund, which has been set up to aid grandmothers whose grandchildren have been orphaned by AIDS/HIV and who are, as a result responsible for the children’s welfare. Such families are at present subsisting on an unbelievable 300 baht per month and desperately need this assistance. The money will be used to buy books, clothes and other essential items. A local volunteer, Khun Nit, soft spoken and entirely committed to helping the grandmothers, has been dispensing money to help meet their needs for a long while, and will be speaking at the next Expat’s Club meeting to explain how urgent the situation has become. Zonta’s present “grandma base” includes about 30 women; however, it is estimated that there are at least 500 in desperate need right now. As a result, more money needs to be raised in order to expand the list as soon as possible. Most fishermen have stopped hunting giant catfish in the Mekong River to help save them from extinction, as a changing ecosystem already poses a threat to the fish and their habitat. A giant catfish farm in Thailand breeds the rare species in the name of conservation. We have more details in this report. The scene of giant catfish being caught in the Mekong River is now a rare one, as the catfish population has dropped and most fishermen have stopped hunting them, joining the conservation trend to protect the big freshwater fish. Boonrien Chinarat is a founding member of the giant catfish club and the Headman of Had Krai Village in the northern province of Chiang Rai. He used to fish for giant catfish but stopped 10 years ago. He said “People outside of the village did not understand our way of life. They think we harm the fish. Nowadays, most of the giant catfish hunters have stopped due to the reduction of the fish population.” He believes that the main reason for the reduction in giant catfish numbers is the change in eco systems, caused by the blasting of rapids and clearing of water channels upstream, the habitat of the fish. The spawning grounds where the fish laid their eggs are now gone. Another reason, he suspects, is the practice of fishing by electric shock and dynamite. In Chiang Rai’s Wieng Chai district is a giant catfish farm called “Wang Pla Beuk”. It is owned by a retired fisheries officer, who set up the farm to help build up the stocks of giant Catfish. In 1983, he became the first person in the world to successfully breed giant catfish. The farm has been producing over 100,000 fish a year. It has also been helping the Had Krai villagers raise their own fish.